In his 22-year service in the Explosive Ordnance Disposal Bureau (EOD Bureau), Senior Bomb Disposal Officer Yuen Hon-wing not only has set up a professional team and secured a group of trustworthy partners, but also identified the directions for work and life. "When I applied for the post of Police Inspector, I told the Final Interview Board that I hope to serve society. I have been serving the Red Cross as a volunteer since my secondary school days. 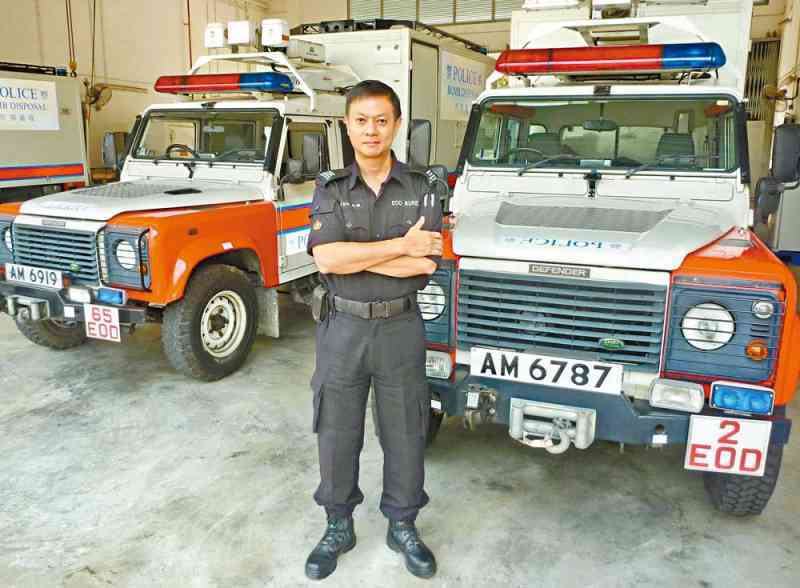 I am no stranger to the concept of serving society, and this was the reason for me to join the Force," said Mr Yuen. Attracted by the multi-faceted nature of police work, Mr Yuen gave up his original job in a laboratory. After joining the Force, he opted for the training provided by the EOD Bureau. "I find bomb disposal work very interesting because I never did it before. The training was a challenge for me. After training, I became a member of the EOD Cadre. Since then, I understand the professionalism and the required technical knowledge of bomb disposal." At the same time, Mr Yuen started contemplating the directions for his life and work. "The EOD Bureau has given me room for my professional development. Some people might be unwilling or reluctant to participate in bomb disposal work, but I found I am able to cope with this task. I saw room for improvement, new knowledge and opportunities ahead." People might ask Mr Yuen whether bomb disposal is dangerous and whether he would quit the job because of danger. "The task has a certain degree of risk, but this is only part of the work challenge. With proper training, procedures and equipment, the potential danger can be overcome," he noted. In 1992, Mr Yuen became an Assistant Bomb Disposal Officer. Some people might regard organisational values as "mere slogans". But Mr Yuen and his colleagues have found clear directions from such values. During the interview with Mr Yuen, three organisational values inscribed on the wall caught the attention of the author: Integrity, Professionalism and Loyalty. "Our common value is Integrity. As bomb disposal officers, we are the only people who know the explosives, understand the situation and face the crisis. We have to understand the types and impacts of bomb and assess every crisis. The second value is Professionalism, which is treasured by the Force, especially the EOD Bureau. We interpret Professionalism as having thorough knowledge, such as bomb making, properties of explosives and use of equipment. In every crisis, we need to make appropriate decisions and this is also our common value. "The third common value is Loyalty. In the EOD Bureau we treasure teamwork and team members are loyal to each other. Bomb disposal, which is normally handled by a single person, is a task that requires the backup of a team. To a certain extent, my life depends on my assistants. When I entered a bombsite, the assistants acted as observers and watched out for my safety. While I was pre-occupied with the bomb, the assistants handled all the other jobs." Mr Yuen is also responsible for training the next generation of Bomb Disposal Officers. He hopes the organisational values would be passed on to the next generation and beyond. "Organisational values can hardly be learned from textbooks. We have to impress on them the importance of appreciating organisation values." Besides organisational values, Mr Yuen also realises that seeking meaning from work might have an impact on life. Speaking of the "Philosophy of Bomb Disposal", he said: "Every bomb is a crisis. When there is a crisis and everyone steps back, we step forward and resolve the crisis. As the only one solving the problem, we have to make professional decisions and balance all factors." Cultivating appreciation of the meaning of work can begin with understanding organisational values. Aspirations can always give us directions for planning our work and life. When we internalise such aspirations, we can appreciate the efforts made for work and tasks, realise the meaning of giving and contributing, and maintain momentum at work. A person who can link up the values of work and life, like Mr Yuen, can fill each job with joy. "I go to work happily everyday and I love my job," said Mr Yuen. Having the ability to appreciate meaning from work is a crucial element for a happy life.